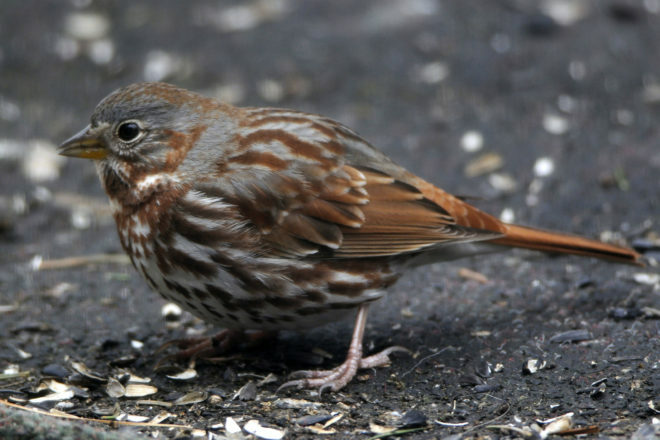 The fox sparrow’s large feet are great for scratching in the forest duff. Photo by Roy Lukes. As a subscriber to the Wisconsin birders’ network, I have fun reading posts about the migrating birds seen in southern Wisconsin at this time of year. My late husband, Roy, and I often said that spring moves north at about 125 miles a week. During the last week of March, the posts shared good news: the first fox sparrows were spotted in the southern counties. Roy and I looked for these large, migrating sparrows each spring with great anticipation. Their habit of jumping and scratching on the ground with both feet is their way of unearthing insects under the forest duff. It’s quite a dance they do! Their breeding range is all across Canada, from the Atlantic to the Pacific and Alaska, as well as the mountainous west. This sparrow might have several subspecies. There are several color variations, mostly with western birds. A California variety is predominantly gray; one with a gray head lives in the western mountains; and a sooty brown one inhabits the Pacific Northwest. “Ruddy,” “rusty” or “rich chestnut” describes their most noticeable color perfectly, but the beautiful, earthy colors also include grays, tans, browns, black, and white. The throat, chest and belly are white and heavily streaked with arrow marks of dark brown. Bold, rusty, triangle-shaped patches border the throat, and most have a larger dark spot in the upper middle of the breast. The lower mandible is a flesh to light-yellow color, and the legs and feet are pink. Sexes look so much alike that males rely heavily on song to locate a mate. Although the fox sparrows’ foxy-brown backs and tails make them stand out among other sparrows, they possess typical sparrow characteristics. They are small birds, but the fox, Harris’s and white-crowned varieties are the largest of our native sparrows. All three are in the seven- to seven-and-a-half-inch range, whereas most other sparrows are smaller. The heavy brown streaking on the fox sparrow’s white breast is very prominent. Photo by Roy Lukes. They are very good singers and strong fliers. They do not typically nest in colonies, but they’re fairly social, nesting close to others of their kind and becoming gregarious when migrating. American tree sparrows and dark-eyed juncos have been here all winter, feeding sedately on the ground. As soon as a fox sparrow arrives on the scene, its jumping and scratching makes it stand out, and last fall’s dried leaves get tossed aside as it looks for its next meal. 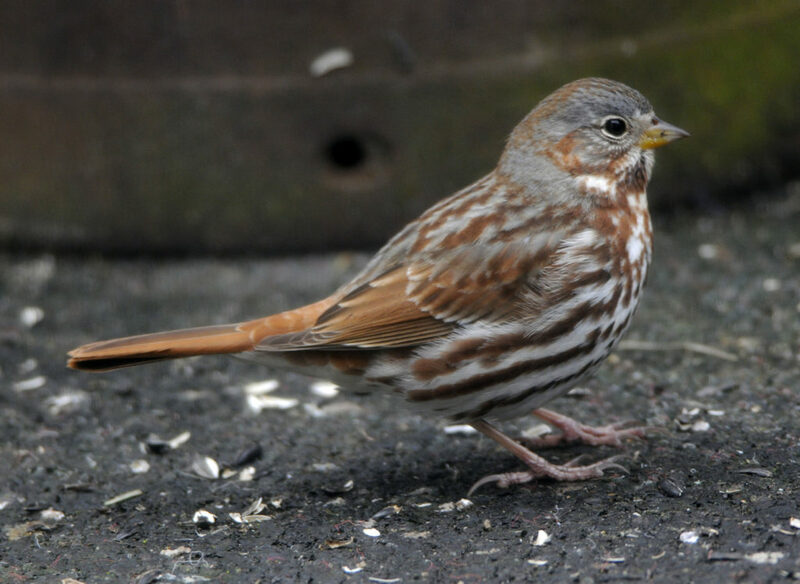 Fox sparrows’ preferred habitat is wooded undergrowth; dense, brushy areas; and shrubs. They nest near or on the ground, where they can scratch for food and remain hidden from predators. In fact, their greatest threat is during migration, when unseasonably cold weather, snow or freezing rain can wipe out thousands overnight. These chestnut-colored beauties have only one brood per year of two to five eggs. Incubation takes 12 to 14 days, and the helpless young grow in the nest for 10 to 12 days. Chipmunks, weasels and snakes can prey on the young, so adults do a “broken-wing” distraction display to lure predators away from the nest, like the killdeer does. The record of spring migration through Door County during the past 18 years shows the earliest first sighting as March 20 in four years and the latest as April 7 in 2011. During the unusually warm spring of 2012, when we had some 80-degree days in March, fox sparrows were spotted from March 8 until April 24. In 14 years, they had moved north before the end of April and were seen into early May in only three of the last 18 springs. Another large, migrating sparrow – the white-crowned – nests in many of the same areas as the fox sparrow. A rarer species, the Harris’s sparrow, nests in a much smaller area in far north-central Canada and into the Arctic. Its normal migration flyway is through the Plains states. We enjoy the four or five sparrow species that migrate through Door County each year and the nine species that are known to nest here. They all require a particular habitat for nesting, laying eggs, and incubating and raising their young. We can help these sparrows by not destroying the environment they need for survival. We will gladly fight to preserve it, knowing that these champions of the sparrows – the fox sparrows – will stop here briefly during their spring and fall migrations to feed, rest and give us the thrill of seeing their gray and rust beauty.